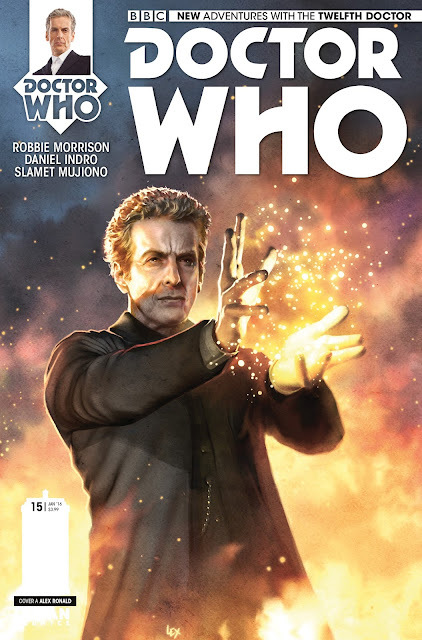 Titan Comics: Doctor Who - THE TWELFTH DOCTOR #15 Review | Warped Factor - Words in the Key of Geek. Hyperios Rises No More, says Tony. As comic-book stories go, The Hyperion Empire has been a good idea that’s sometimes struggled to justify its five-issue length, and sometimes absolutely hasn’t. This concluding part has almost everything you’re looking for in the final part of a story about walking suns invading the Earth and sucking our own sun dry. There are grand plans, only some of them the Doctor’s, there’s betrayal, pointless death, the Doctor using stolen alien tech against the invaders, dealing, double dealing, more pointless death of one of the ‘lead’ characters in the story, trickery, boasting, lies, banter, and a kind of salvation for another main character that dials into an on-screen Christmas Special from years gone by. If at times The Hyperion Empire has felt like it’s spread itself out and made itself comfortable, giving us different viewpoints on the invasion, from astronauts on the International Space Station to survivors in a Tube base, to life for an enslaved human race behind the ‘firewall’ of the Hyperions, this issue wastes barely a panel in pushing the story to its conclusion, taking its toll on both the character-list and the emotional state of the reader. 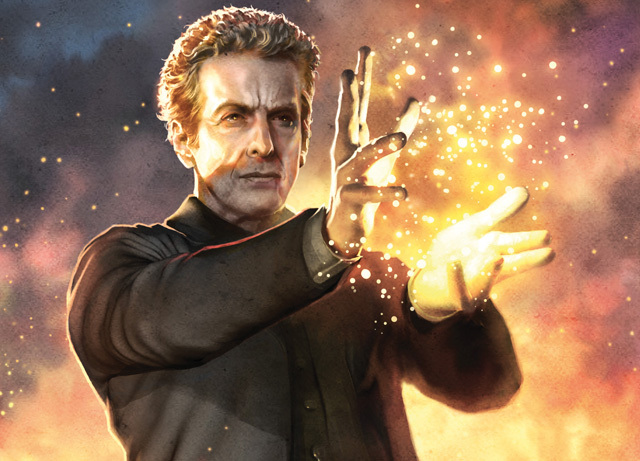 At times, it seems to show the Twelfth Doctor we got to know in Series 9, the over-confident, no-rules-can-touch-me Doctor, who goes above and beyond all the standards that have typified the hero we’ve known, and at others the typical, cleverest-life-form-in-the-room that we’ve known, and that showed himself perhaps most recently in the Zygon two-parter with his threatening boxes of absolutely nothing at all. Here, there’s death en route to the Doctor’s cleverness, and it’s an odd one, in that it’s one of those deaths you sort of turn to modern Doctor Who to get around, or go back and reverse, but what happens here is so very far from that, it almost leaves you cold. The Doctor refers to it as one too many, and is spurred on by it to one of his ‘nobody else dies here today’ speeches, and to do brilliant things, but there’s almost the sense of not enough time being available to devote to its impact to give it the oomph it deserves in Robbie Morrison’s final instalment of this tale of suns and sun-killers. It’s rare that I take time out to highlight the work of the letterers on the Titan comic-books, and that’s frequently remiss of me, but Richard Starkings and ‘Comicraft’s Jimmy Betancourt’ here deserve a mention for substantially adding to the threat and menace of The Scorched (ash-zombies, if you’re just joining us) in the early panels of this issue. Overall, the artwork by Daniel Indro and the colourwork by Slamet Mujiono are energetic and rich (as perhaps you’d expect from a story where the chief visual cue is the bright orange of walking suns), though never overtly ‘realistic’ – as has been the case throughout this story, the artistic cue seems to have been the war stories of 70s and 80s military comics, but it works better, given the nebulous subject matter of flames and ash, than any attempt to be pinpoint accurate or photographic. The pair give a solid sense of visual presence and render both characters we know and characters who only exist in this story with a degree of detail that makes them believable in spite of the stylised look of the piece. In terms of the villains, this storyline has established the Hyperions far more fully than they’ve shown to us in the past – individuals, a command structure and even a social strata have been delivered to us over the course of these five issues, and that sense of a complete community continues here – individual Hyperions are named, rather than just being ‘shouty dictator-sun number one’ – adding a distinctive sense of their reality to the issue. Morrison has done a good job this time around in terms of delivering a memorable ‘monster’ species who have their own internal consistency. The ending is a little sugary but with the lack of time to feel the impact of the earlier death, it doesn’t feel over-sweetened – unlike some on-screen New Who, the dead are for the most part allowed to stay dead and the impact, such as it is, of those deaths is allowed to stand. There’s perhaps a Fires of Pompeii vibe to the ending, the saving of someone almost as a consolation for the actions of a universe that wouldn’t allow the saving of everybody. And so ends the Twelfth Doctor’s first year in comic-books, and a roller-coaster ride that’s taken us from the Swords of Kali and the gorgeousness of Indian goddesses, through the creepy pan-dimensionalism of the Fractures, through meeting Emily Bronte, to the Las Vegas of the ‘Wolf Pack’ and Rassilon’s Roulette and here to a full-on invasion and subjugation story. What does Year Two hold? Let’s find out together in January, 2016.